Matt Irwin (52), Zach Trotman (62), and the Bruins’ defense had far too many breakdown to defeat the Jets. By the time Drew Stafford was ready to snap off Thursday’s game-winning goal, Zach Trotman stood on an island in no-man’s land, trying to cover two Jets at once. This is not how the Bruins want to play. It does not matter who’s dressed, who’s been traded, or who’s injured. Regardless of their roster, the Bruins protect their net with multiple layers. If one perimeter is breached, the next wall of protection stands upright to fend off the attack. Just about every layer disintegrated in the Bruins’ 6-2 season-opening tumble. 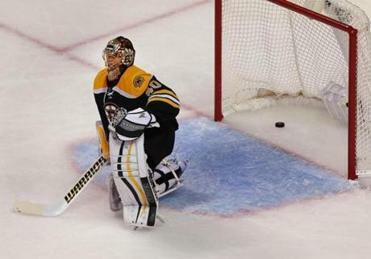 Stafford’s deciding goal, the third puck that slipped past Tuukka Rask in the second period, underscored the issues that could bury the Bruins if they don’t correct them quickly. The Jets overwhelmed the third line of Jimmy Hayes, Ryan Spooner, and Brett Connolly. Matt Irwin, who exchanged puck coverage with Spooner, got caught up high. After dipping below the goal line to seal off what he read as a behind-the-net pass, Trotman was in full scramble mode in front. Connolly didn’t have time to collapse into the slot. David Krejci and David Pastrnak scored Boston’s goals, but the final 40 minutes of the season opener stoked the fears of Bruins fans. The Bruins used to be in position to keep such breakdowns from happening. They could shelter Spooner by deploying him with a stout defensive duo. They could keep the third pairing from performing heavy defensive lifting. Injuries, absence of depth, and personnel decisions left Julien, for one game, without many options. Had Zdeno Chara and Dennis Seidenberg been healthy, Irwin and Trotman would have been healthy scratches or playing in Providence. Instead, Irwin and Trotman, like their teammates, had nowhere to hide when Winnipeg’s barrage began. Some mistakes are simple human errors. In the second, Irwin tried to start the breakout from behind his net. When he tried to move the puck, Andrew Ladd closed in and stripped it off his blade. Seconds later, Blake Wheeler gave the Jets a 2-1 lead. It would be hard for Irwin to replicate that boo-boo even if he tried. But the kind of mistakes that jack up a coach’s blood pressure are the ones caused by lack of focus, cloudy thinking, and bad habits. They are the mistakes that can creep into a team’s structure, hang around, and become difficult to eliminate, even after just one game. Before Irwin’s cough-up, the fourth line went for a change. This caused Irwin, who didn’t have a clean outlet up the ice, to hesitate behind the net. In the second, Joe Morrow was in position to start a standard breakout from the left side of the defensive zone. Matt Beleskey, David Krejci, and David Pastrnak blew the zone quickly. Morrow sent the puck off the left wall and onto the blade of Dustin Byfuglien. On the counterattack, Mark Scheifele whistled the tying goal past Rask at 5:26. After Stafford’s eventual winner, Pastrnak punched back at 1:25 of the third, making it a 3-2 game. But on Pastrnak’s next shift, the Jets reclaimed their two-goal lead. With the puck deep in the Winnipeg zone, Irwin did the right thing by pinching down the left wall to keep the cycle alive. But when Irwin pinched, a forward had to rotate high to cover his spot. So when Alexander Burmistrov retrieved the puck and chipped it out of the zone, the Bruins didn’t have support to mark Chris Thorburn peeling up the ice. Krejci tried to retreat. But the center was a step late in closing off Stafford’s centering pass. Krejci backchecked hard, only to help Thorburn’s shot tumble past Rask at 5:17. The Bruins knew the start would be turbulent. Torey Krug and Adam McQuaid are usually the No. 3 pairing. Instead, they stared down Winnipeg’s top line of Ladd, Wheeler, and Bryan Little. Morrow is still developing. Kevan Miller is best positioned on the No. 3 duo. The current six-pack cannot hang with a defense such as Winnipeg’s, which had Tyler Myers and Toby Enstrom as its third pairing. It’s why with a borderline NHL blue line, the Bruins needed a flawless Rask and committed defensive reinforcements from their forwards. They had neither. The Bruins will improve defensively starting on Saturday against Montreal. They cannot be any worse.